Great Advice - For Free! You need someone that will understand how you intend to use the services you require. When moving to a new office, you need someone that will have your electrical and data fit-outs ready on-time. And for changes to existing offices, you need someone to perform the work without disrupting your business activities. Franklin Bell are Perth Commercial Electricians with more than a decade experience in the electrical and communications industries. We understand the unique challenges you face when dealing with changes to your workplace, and we're able to make it easy to get the results you need. Not sure where to start? No need to worry - we'll listen to your requirements and deliver the best solution, while giving you great advice and solid results from start to end. We do all commercial electrical work, data cabling and telephone systems. Plus! Every bit of work we do is fully guaranteed for your peace of mind. Our personnel are knowledgeable, helpful, polite and friendly. What's more, they're well presented, clean and efficient - just what you need in your work environment. To get your commercial electrical project done quick, easy and professional - contact us today for a free quote. You'll be able to carry on with your business while we take care of your office project. Contact Us today for a Perth Commercial Electrician that wil have you pleasantly surprised. Need more information? 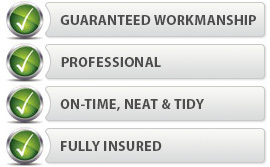 See our complete range of services.